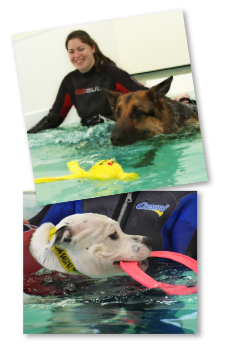 All dogs whether swimming for recovery or for fun will have a hydrotherapist in the pool with them at all times to be on hand to help your dog gain confidence in the pool environment and to offer reassurance if necessary. Being in the water will allows us to connect with your dog and they quickly learn to relax and trust us aiding in the rehabilitation process. Each dog wears a float coat and one of our colars for safety unless otherwise directed by the Hydrotherapist. Time spent in the water swimming depends entirely on your dogs' inclination to swim and depending on how your dog reacts to the pool, the therapist may spend time making your dog feel relaxed before they get in. Rehabilitation swims (orthopaedic conditions, soft tissue injuries, neurological conditions and degenerative diseases) – a combination of swimming and rest periods to maximize the benefits of the warm water and hydrostatic pressure acting as an anti-inflammatory, increasing recovery time. Hydrotherapy is excellent as part of the management of osteoarthritis. The warm water relaxes the muscles surrounding the joints, easing pain, and the non-weightbearing aspect means that fitness can be maintained without causing further pain and joint damage. Osteoarthritis can develop early on in life, especially where there are congenital joint conditions such as elbow or hip dysplasia, so hydrotherapy is not just for old dogs! Hydrotherapy is a powerful tool in the rehabilitation of neurological conditions such as disc disease and CDRM. Without the worry of weightbearing, the limbs can move more freely, and the gentle resistance of the warm water helps to build up muscles in a safe way. Our hydrotherapists are experienced with all types of neurological conditions and, where required, two hydrotherapists can be in the pool with your dog to ensure that the spine is straight and supported during the whole session. Our hydrotherapists can also encourage the movement of the limbs where the neurological condition is more severe, to help to reprogram the nervous system alongside muscle building. Cruciate ligament disease is all too common in dogs, especially active large breeds. We have found hydrotherapy extremely beneficial for post-operative rehabilitation of cruciate repair and in cases where surgery is not performed, to build up the supporting muscles and reduce the risk of surgery being required. Hydrotherapy is extremely useful for the older dog, as it is non weight-bearing and will relieve stiffness, pain and the strain of old age. A full range of motion is achieved in the pool environment, allowing joints to move freely and muscles to strengthen. Additionally, the cardiovascular exercise helps to keep the heart and lungs in good condition. Hydrotherapy is an excellent form of exercise for young dogs. The non-weightbearing exercise is a safe way to burn off all that excess puppy energy without the risk of damaging developing bones and joints. In addition, the mental stimulation of a new situation provides an ideal socialisation opportunity and exposes your puppy to swimming in a completely safe environment. We will swim puppies from the age of 4 months, provided that they are fully vaccinated. In addition to our rehabilitation programs, we also offer fun/fitness swims to dogs of all ages. Swimming is a great way to build muscle, improve cardiovascular fitness, and burn off energy. In fact, it is one of the best total body conditioning exercises a dog can take part in! Most dogs love to swim and the mental stimulation combined with a good cardiovascular workout will often lead to a quiet evening for the owner. This program is perfect for working, agility and show dogs to help them stay in peak condition.